Unless you really look closely at the image above, you might not realize you aren’t looking at a normal Game Boy Advance; which is sort of the point. Even though it retains the looks of the iconic Nintendo handheld, this version built by [Akira] is supersized for adult hands. How big is it? To give you an idea, that screen is 5 inches, compared to the 2.9 inch screen the original sported. Unlike most of the portable gaming hacks we’ve covered recently, this big-boy GBA isn’t powered by a Raspberry Pi. 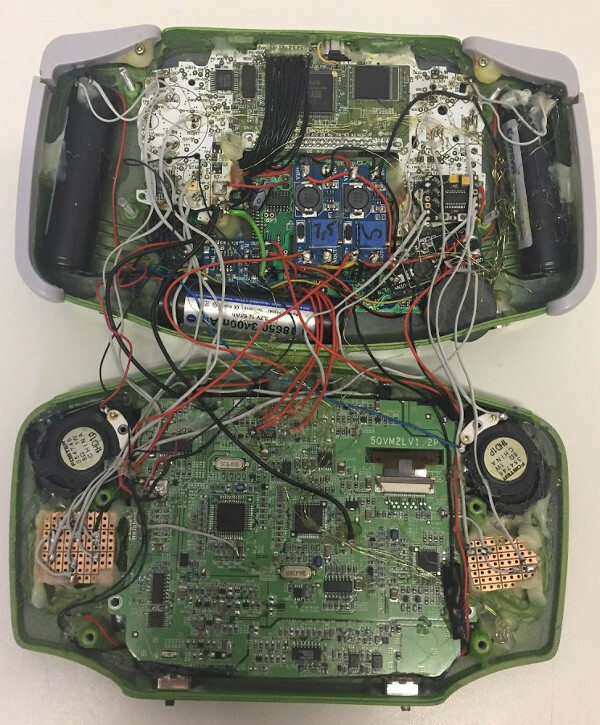 Internally it’s packing a genuine GBA motherboard, which has been wired into a portable screen originally intended for the PlayStation. Though that may be understating things a bit, as getting the round PCB of the original screen into the rectangular shape of the GBA meant it had to be cut down and the traces recreated with jumper wires. The original CCFL backlight of the screen had to go in the name of battery life, and in its place is the backlight system pulled from a Nintendo DSi XL. But where did [Akira] get a giant GBA case to begin with? No, it isn’t 3D printed. It’s actually a hard carrying case that was sold for the GBA. The carrying case obviously didn’t have a cartridge slot or openings for buttons, so those sections were grafted from a donor GBA case. So despite the system overall being so much bigger than the original, the D-Pad, face buttons, and cartridge slot on the back are at normal GBA scale. The GBA XL is really a labor of love; browsing through the build log you can see that [Akira] actually started the project back in 2014, but it kept getting shelved until more research could be done on how to pack all the desired features into the final device. While this may be the most historically accurate attempt at making a bigger Game Boy, it certainly isn’t the first. There seems to be a fascination with turning the quintessential pocket game system into something that’s quite the opposite. Most hacks need some fair bit of skill and knowledge if you want to come out successful at the other end. Others, you just plunge in blindly with a “heck, it’s already broken so I can’t make it any worse” attitude. Throwing caution to the wind, you dive in, rip things up, and see if you can manage to catch the bull by the horns. [Jim]’s cheap LCD TV, barely a few years old, died. It was purchased from the store whose blue polo-shirted cashiers can drive you nuts with their incessant questions. [Jim] just rolled up his sleeves and rather haphazardly managed to fix his TV while adding an extra feature along the way. His initial check confirmed that the LCD panel worked. Using a flashlight, he could see that the panel was displaying video which meant it was the backlight that wasn’t working. Opening up the TV, he located the LED driver board whose output turned out to be zero volts. [Jim] happened to have a lot of WS2812B strips lying around, along with their power supplies and RGB color controllers. The obvious solution was to ditch the existing LEDs and power supply and use the WS2812B strips. 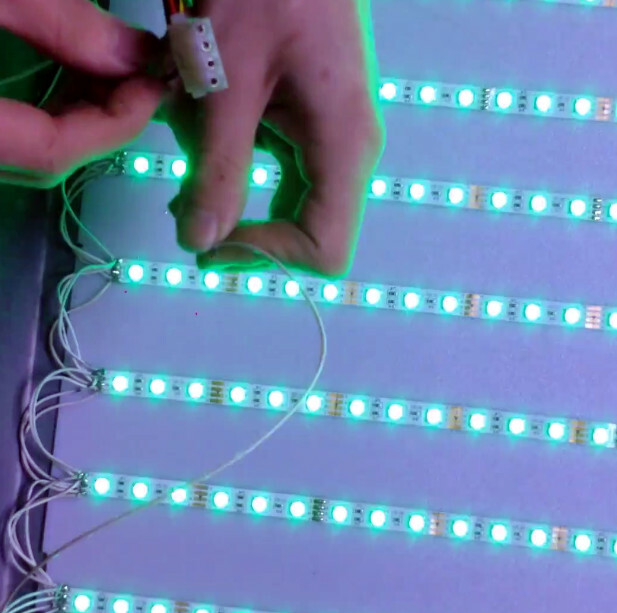 Surprisingly, the original backlight consisted of just 21 LEDs arranged in three rows. He ripped those out, put in the WS2812B strips, and taped the jumble of wires out of sight. After putting it back together, [Jim] was happy to see it worked, although the new strips were not as bright as the old ones, causing some uneven light bands. He solved this by adding a few more strips of LEDs. It took him a couple of hours to fix his TV, but by the end of it, he had a TV whose backlight could be adjusted to any color using the external color controllers — although we’re not too sure what good that would be. Consistent contributor [Ken] has cooked up another contraption with his directional booklight. Combining an LED strip and privacy screen filter inside a wooden enclosure, this handy tool is made for someone who wants to read in bed without disturbing anyone else. The booklight sits on top of the page, the LEDs light up just the given area, and because the privacy screen only allows light to come straight off the page, only the reader can see any light and any other viewing angle is obscured. [Ken] thought of everything. Rather than have the light stay on while the booklight is lifted to turn the page and possibly flash an unsuspecting slumberer, a tactile switch on the underside turns the light on only when it is pressed against the page, allowing very little light to escape. Future upgrades include another switch on top to detect when the book is closed, and an accelerometer to detect when the reader may have fallen asleep.